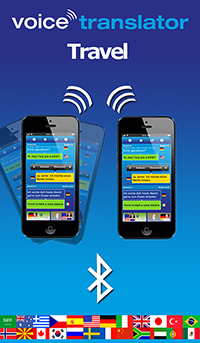 Linguatec Language Technologies today is pleased to announce Travel Voice Translator, a voice to voice interpreter app for iPhone, iPad and iPod touch with Bluetooth chat function, offline folder system and translations into 66 languages. Easy to use and perfect for travelling and business. Travel Voice Translator is now available at the special sale price of 0.69 (GBP) instead of 2.99 (GBP) for a limited period of time. 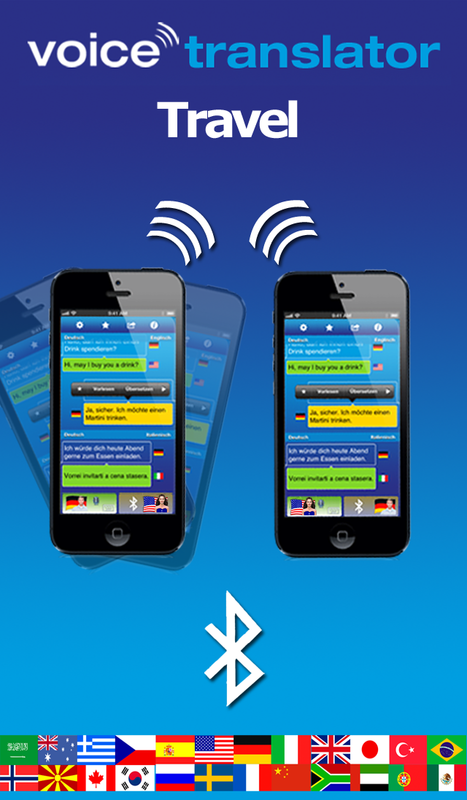 Travel Voice Translator enables you to communicate in up to 66 different languages. Simply speak (or enter text) into your mobile device and read or listen to the translation. You can use the app either on your own iPhone, iPad or iPod touch or you can communicate multilingual between two iDevices. Shake & Connect with Travel Voice Translator, the world’s 1st voice to voice interpreter with patent-pending Bluetooth chat for iPhone and iPad. Just shake your iPhone and connect! Where all other interpreting apps end, Voice Translator goes one step further, by connecting two devices via Bluetooth. 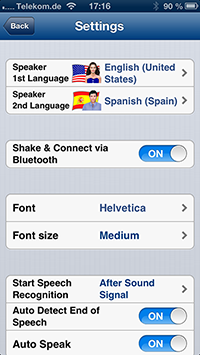 Now your partner can comfortably listen to the translation and reply to it on his own iPhone or iPad. Offline folder system: Save your translations and the speech output comfortably in clearly arranged offline folders. Have your translated dialogues ready to hand even without internet connection. With speech recognition for 33 languages, translations in up to 66 languages and a voice output for 38 languages (37 female and 16 male speakers) Travel Voice Translator supports you worldwide while travelling, in business, chatting to foreign people or learning languages. - Clear user concept: Just select language pair, touch speaker symbol, start recording (or enter text) and immediately listen to (or read) the translation. - Pop-up menu makes it simple to read out, save, copy or edit dialogues, or to share them with others by e-mail or SMS. - Quick and easy alteration of target language during the conversation. Who needs Travel Voice Translator? Travelers, business people, tourism employees, technicians, doctors, lawyers, students, teachers and everyone who wants to communicate in several languages. The App requires Internet connection! After having saved the dialogues offline in folders, they will be available without internet. For best speech recognition results it is recommended to use short sentences, aim for a clear and steady voice, dictate punctuation marks and minimize background noise. Based in Munich, Germany, Linguatec Company develops software for the PC in the areas of translation, voice recognition and voice output, and they are internationally known for their desktop products Personal Translator, Voice Pro, and Voice Reader.